I’ve written many times in the past about Sliderocket – the company that is reinventing presentations for a live, on-demand and insight driven world. Sliderocket is a cutting edge content creation tool, a useful asset store, and an analytics driven delivery channel. It’s this very breadth of functionality that has always been problematic for me. When talking with Sliderocket CEO Chuck Dietrich, I always struggled to know where Sliderocket’s value proposition really lies – be it collaboration, analytics, or content management? With the fall release, Sliderocket very firmly positions itself. The tagline for this release is that Sliderocket is doing for presentations what blogging has done for media – creating a dynamic location for engagement between parties, rather than the broadcast-only situation of traditional presentation tools. As Dietrich pointed out to me, enterprises generally have two main modes of communication – email for high volume transactions and presentations for deeper communication. The challenge is to increase the likelihood that presentations will be effective when the presenter isn’t actually there – part of this is achieved by giving presentations a truly dynamic feel with comments etc. 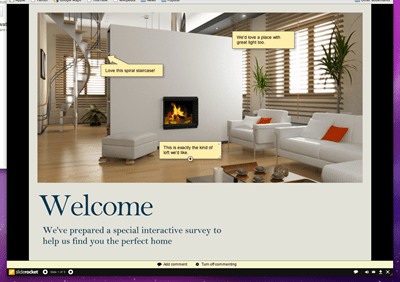 feedback forms and polls – users can create interactive conversations with colleagues, prospects, customers and partners by allowing viewers to provide comments anywhere in the slide deck through virtual sticky notes. I’m pretty excited about this – as I’ve said I’ve been watching Sliderocket for awhile now and this is the first release that really gives me a good handle on the unique proposition for the product – it’s exciting. Check out he video below demonstrating some of the new functionality, and have a look at the screen captures below. 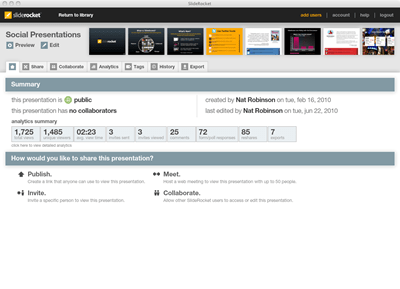 A dashboard for a presentation – insights into usage and parameters – all from one place. Thanks for sharing Ben, nice article. This looks like a great application that I will be trying out. So did the new release answer which one it is? Or is it a combination of all/some of these? It’s about doing for presentations what blogging has done for media. Since you’re a competitor Sumanth, hat’s your main proposition? Touche! In my defense, it was an innocent query! Our value proposition is doing for all documents – presentations, spreadsheets and word processing docs – what blogging has done for media! We are formally launching next week and would love to give you a briefing if it is of interest.